Remove the shank (the thin end of the leg). 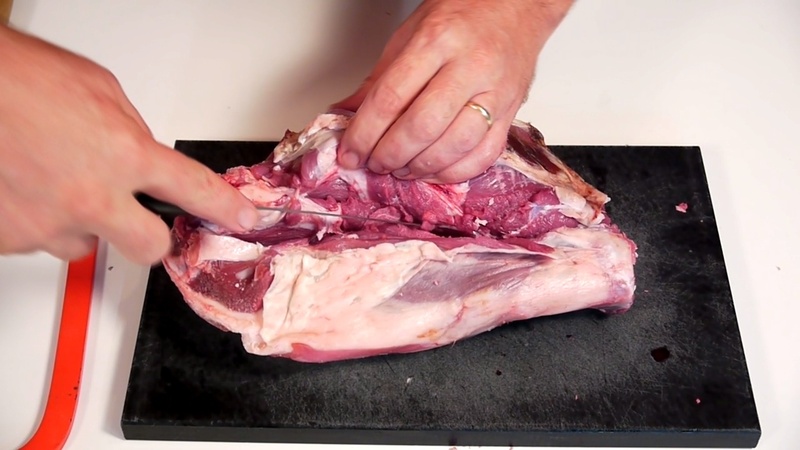 If you buy a leg of lamb from a butcher or a supermarket, or if it is frozen, it has been often done for you. There is not much meat on the shank and it is in the way when you debone. Even when you just want to roast a whole leg of lamb is still a good idea. It is about as long as the rest of the leg of lamb and there is usually not enough room on the roasting pan. You will can find the joint by bending the leg and feel where it bends. The you cut down to the bone at the joint. As soon as you reach the bone you use a saw to saw through the bone and cartilage. It is ok to use an ordinary hacksaw for the job. If there is a little back bone too, you can remove it the same way. Use a knife on the meat and a saw on the bone. It is a waste of space with no meat on it. Then you should find the bone on the inner side of the leg. That is where it sits closest to the surface. Cut into the meat along the bone, until you hit the bone. When you reach the bone, you cut down around the side of the bone so that you get it released from the meat. As you try it more times, you will know where to cut and can cut deeper and faster. But that can only be learned by doing. As a beginner you just cut a little at a time. Long shallow cuts. The leg consists of many different muscles that are not linked particularly well together. So if you cut too deep you risk the meat simply falling apart. Also remove any dry spotted skin, thick tendons and large pieces of fat. 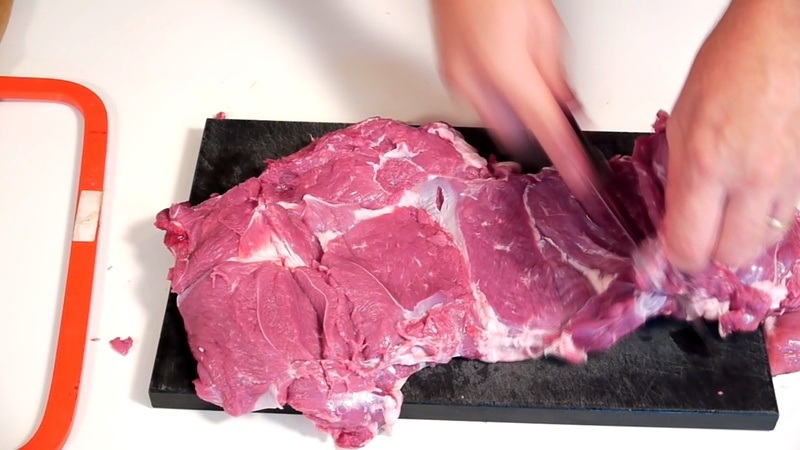 It is a really good cut to know for any thick cuts of meat. As you can get your meat in virtually any thickness you want. Thin pieces of meat fry quickly, and get more of the nice browned surface. And there is room for more marinade on the larger surface. So it cooks faster and gets more flavor. Normally one would put the meat down and cut in from the side, in the middle of the meat. You can not do that with a boneless leg of lamb. There you need to cut from where the bone used to be, from the center of the meat, and then "fold it out." This can be done once or twice until it has the thickness you want. But again, be careful not to make it too thin, as it will make the muscles fall apart.